Each year, he?d bring teams down to the Penn Relays. Those were memorable trips. So many wrote to us about the huge impact ?Coach Yed? had on their lives. One athlete he coached in the 1980s became his son Danny?s godfather. He made countless lifelong friendships with athletes. ?Passionate, caring, selfless, funny, competitive, consistent, positive, strong, organized, modest, and unique,? is how Assistant Coach Blair Moynahan described him. ?His true gift was teaching people around him how to live. He led by example. He was an amazing teacher?and an extremely dedicated coach, and he loved his family to the core. The man knew how to live,? said Moynahan. He added, ?I know if he could speak with all of us, he would say, ?It?s all right to remember me, but, right now, keep moving forward, keep working hard, keep setting goals… Everything is going to be okay. ?Be sure to keep talking with each other and take a moment to slow down and enjoy the ones around you.? For Cross-Country Coach Mike Szarkowicz, ?Jim was the consummate mentor. He always had some wisdom, insight, or a joke, to make your day a little bit better. He was an invaluable sounding board. More importantly, he was one of the best human beings I have ever had the privilege of knowing. ?He was the embodiment of passion for our sport, who spent every day for over 40 years getting young students excited and interested in Track and Field. He is a true legend in Rye and his passing leaves a tremendous void that will not soon be filled.? 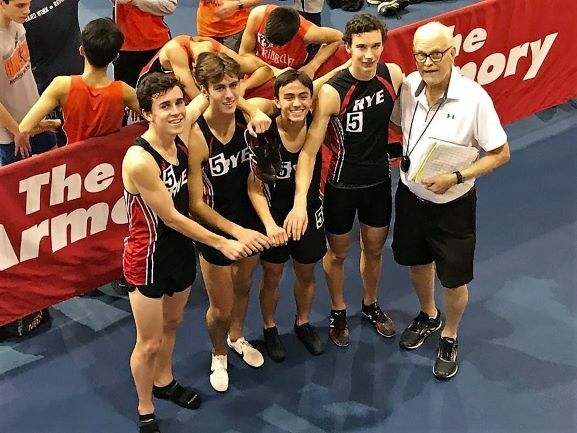 Rye High Athletic Director Mike Arias said that everyone gravitated to Jim Yedowitz because of his wonderful sense of humor and passion for coaching. ?man.? ?He?understood the bigger picture and was able to provide an inclusive environment for all students who wanted to be part of Track and Field.? One of the passions Arias and Yedowitz shared Jim was golf. ?In between coming in to make his daily photocopies, he would often share some golf trivia or to talk about the latest tournament. I will miss those interactions, but what I will miss the most is his love for the Rye Track and Field program and our student-athletes.? Last year?s Boys? captain, Marek Nowak, who is now running for Cornell, said, ?His combination of robust character, commitment to his athletes, and belief in excellence are hard to find. I know that I will hear his words of encouragement in every one of my collegiate races, and I?m dedicated to making sure his legacy is not forgotten.? ?This year?s Boys? captain, Cian Galligan, is thankful to Coach Yed for his kindness, amazing humor, and ability to see the bright side of life. ?After every bad race, he would often congratulate me for having my worst race ever, as I could only go up from there! He made every athlete feel special.? Coach Yedowitz was the consummate role model, said Girls? captain Elena?Perez-Segnini. ?He inspired us to be stronger and faster by building our confidence and making us better people. He?ll always be in my heart. I know he?s watching all my races and is with me every time I run.? Whether a runner broke a record or came up short, ?Coach Yed told us to keep our heads up,? shared Girls? captain Rachel?Adelson. ?That is all he ever asked of us, no matter the results. ?He?was an amazing human being. ?He truly looked out for the well-being of others.? Cassie McWilliams, All-American, professional runner, and parent of current RHS track member Cate McWilliams, was lucky enough to be taught by Jim Yedowitz at Rye Middle School and run for him in her senior year. ?That first foray into running started my career. Coach Yed ignited my love of racing. It felt really strange last week at the Armory. I kept expecting to see him. I am just glad that my daughter had the opportunity to know him too.? Coach Jim Yedowitz with his record-breaking Boys? 4×1 team of Cian Galligan, Bradley Squarek, Owen Nguyen, and John Goldzser, December 21 at the Armory.